The two year anniversary of Hurricane Sandy is steadily approaching. While many business and homeowners have completed their Sandy recovery projects, hundreds more are still living in temporary housing awaiting funding or the completion of the restoration work on their properties. Commercial properties, homes, and even entire blocks on the Jersey Shore have still yet to recover from the damage suffered during this terrible storm. For residents on the Jersey Shore, Hurricane Sandy recovery efforts are an ongoing process. Surrounded by reminders of the damages done by the storm, it can be easy for residents to lose perspective; to look around and feel like the Shore will never recover. This thinking, however, neglects the significant strides made to restore the shore. This report explores the considerable amount of recovery work that has been completed in the wake of Hurricane Sandy as a way to highlight the hard work and determination of the people residing in this storm ravaged area. On October 22nd at 5 AM the NOAA National Weather Service renames Tropical Depression 18 as Tropical Storm Sandy. By Oct. 24th, Sandy’s sustained winds exceed 70 mph and is upgraded by the National Weather Service to ‘Hurricane’ status. Early morning Oct. 29th, Sandy makes landfall in Brigantine, New Jersey, just north of Atlantic City. On Oct 30th President Obama declares major disasters for Connecticut, New York, and New Jersey, making disaster assistance available to those in the heaviest hit areas affected by the storm. Two days later on Nov. 1st, FEMA Deputy Administrator Richard Serino travels to New Jersey to meet with state and local officials, first responders, and disaster survivors’ in an effort to view ongoing recovery efforts. More than 36,000 New Jersey residents apply for federal aid. By the time the storm had dissipated, over $50 billion in damages had been visited upon New Jersey, New York, and the surrounding areas. 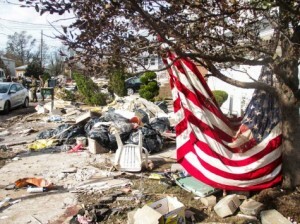 346,000 homes in New Jersey were damaged or destroyed., on top of another 305,000 in New York. By the time the winds cleared and the flood waters receded, over 150 lives had been lost lost. In the wake of the storm, over 2,100 FEAM inspectors were dispatched to storm effected area to survey the damages and draw up plans for Sandy recovery efforts and in the first year inspected over 160,00 damaged homes and businesses. Also during that first year, 5.6 billion in Emergency Federal Aid was paid out to Sandy victims; $3.5 billion from the National Flood Insurance Program, $415 million in FEMA Grants. Many organizations sprung up around the efforts to realize a full Sandy recovery, including Restore the Shore and Rebuilding Together. 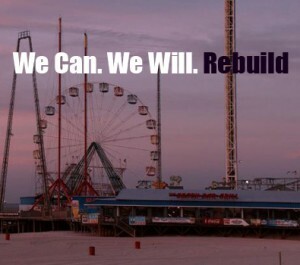 These organizations offer resources and support for Sandy victims. Flood maps in New Jersey and New York have been redrawn for the first time since 1983. 190,000 Residents in these newly defined areas must have there homes elevated above the new flood levels or suffer significant insurance fees. At current, approximately 70% of all storm effected properties have been fully restored, and many towns along the Jersey shore are looking like even stronger than before Sandy. But for those remaining 30%, the road ahead is a long one. There are still hundreds of homes and business up and down the Jersey Shore that have yet to be rebuilt. The Sandy recovery efforts persist and residents of New Jersey and New York will not rest until every bit of damage caused by Sandy has been repaired. Penn Jersey Development has been active in Sandy recovery efforts from the very beginning. A HMGP contractor working alongside the RREM program, Penn Jersey is committed to helping resident of New Jersey rebuild. We have over 25 years experience in home elevation, hazard mitigation, and storm recovery. Give us a call and rest assured that your Sandy recovery efforts will be headed by a company with a track record of success and excellence.